Had a right pain in the backside heading to Kilkenny. Got stuck on a busy and narrow back road and ended up clipping the wing mirror off a protruding branch. Result: broken wing mirror. So, Kilkenny. I was supposed to hook up with a friend, Gavin, but it didn’t work out as he was away on business. He plays off 5 and I should be thankful that he wasn’t around to play as I would have embarrassed myself. A quintuple bogey on the 4th brought my score to nine over. It did get better, if briefly, but I still walked off on 18 over. 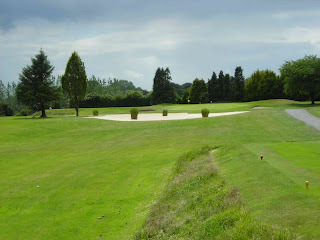 Kilkenny is a reasonably short parkland course on the edge of town and it needs to be approached carefully. 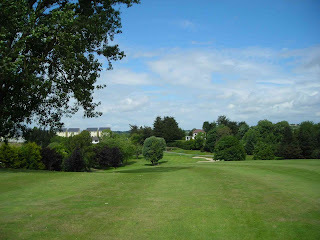 There are many tree lined fairways and the curve of the land will cause plenty of trouble as it deceives you on several occasions on the front 9, and on 13 especially. It is nice and tidy, but if you play it untidily there’s hell to pay. I encountered trees on almost every hole and even when I hit a straight drive – on 13 – the ball kicked sharply left and ended up under the only tree near the fairway. And not just under – it was all of an inch from the trunk. And that’s the end of this run of three weeks – so now it’s home and a brief stint of domestic bliss. Next week it’s the turn of Northern Ireland.